DESCRIPTION: The project includes providing a 55,000 square foot addition on the existing 140,000 square foot facility. The addition contains 160 cells, single bed for housing and a secure medical wing with 12 additional beds. 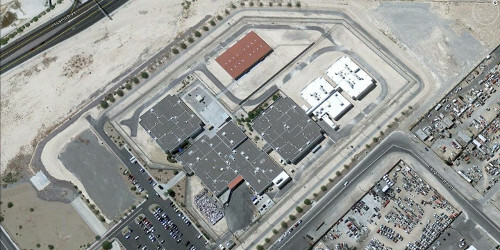 The existing perimeter fence was extended to include the new cellblocks. The security electronics design includes design of a new, fully redundant touchscreen system for each new housing control room and the existing central control room, including database server within the low voltage electronics room. The touchscreen system was integrated to a programmable logic controller (PLC) for door controls, a digital audio intercom and paging system, a perimeter fence detection system and a CCTV system, with motion detection, that also included a network video recording (NVR) system. The new security electronics system was separated from the existing electronics system. The existing PIR perimeter fence system was removed and as the perimeter fence was being extended, was replaced with a fence shaker detection system, extended to cover the entire perimeter. Along the new fence perimeter, a new CCTV system was provided. Low voltage electronics rooms were designed with modular UPS systems connected to a generator backed source to ensure continuous security system operation.